It is almost hard to imagine back when Baylor was still living in the Big 12's cellar, just a few years ago. Now, five straight bowl appearances, two Big 12 titles, and one Heisman winner later, they have proven that they are just not one of the Big 12's top programs, but also the nation as a whole. Though, the team just wasn't quite good enough for their loftiest goal: a CFB Playoff appearance. Despite an 11-1 mark and a thrilling victory against TCU that essentially proved they deserved the Big 12 title outright, the Bears were left just outside the field of four, finishing up fifth in the final Playoff poll. A Cotton Bowl appearance was a fine consolation and despite 550 yards from star quarterback Bryce Petty, Baylor suffered a heartbreaking loss to Michigan State. While Petty has played his last snap with the Bears, there is still a crazy amount of offensive talent returning, and the defense should continue to take steps. Perhaps this is the year that the Bears make that Playoff appearance, though probably a year later than they would have hoped. Backfield: Petty waited behind RG3 and Nick Florence before eventually taking the reigns of the Baylor offense and putting up insane numbers. He exploded for numbers of 8,055 passing yards and 61 touchdowns during his two years as starter, while also averaging 9.7 yards per attempt. While having a great quarterback like Petty leave will certainly not be a good thing, the offense shouldn't miss much of a beat under junior Seth Russell. Russell filled in a little bit early in the year when Petty was struggling through injuries and was terrific, with 804 passing yards and eight touchdowns. Russell has the big arm that this offense needs to hit all it's deep play threats, and he also has a great mind and feel for the game. And, not taking anything away from what RG3, Florence and Petty did, but the quarterbacks don't have to work as hard when there are so many impact playmakers surrounding them, like Baylor has had. 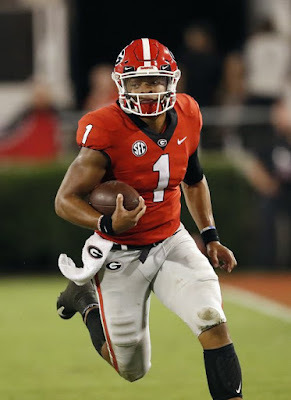 Russell only proved to the college football world that he was ready with a wonderful spring, and he should enter 2015 with high expectations. Russell will be joined in the backfield by an abundance of weapons starting with junior Shock Linwood. Despite having one of the coolest and flashiest names in college football, Linwood's production and talent are very serious. While Baylor's offense is mostly thought of as one that chucks the ball all over the field to it's talented receivers, it relies actually very heavily on the ground game to give it a much needed balance, and Linwood is at the forefront of that. He ran for 1,252 yards and 16 rushing touchdowns a year ago, which were second in the conference in both categories. Standing at just 5'9", Linwood possesses incredible quickness and natural elusiveness, but has surprising power and durability and he should put up huge numbers once more in the Bears' wide open attack. Along with Linwood will be sophomore Johnny Jefferson, who had a very good 2014-2015. Jefferson put up 524 yards and six touchdowns himself, and should only improve in his second season of legitimate action. Jefferson is another speedster like Linwood, who is always ready to bust open a huge run. Expect Art Briles and his son, Kendal who takes over for Phil Montgomery at offensive coordinator, after Montgomery ditched to take the head coaching job at Tulsa, to also employ junior Devin Chafin often. Chafin is a little bit more powerful than Linwood or Jefferson, and proved he was a major help in the red zone when Baylor needed him, with eight touchdowns. With those three ahead of him, touted recruit JaMychal Hasty will struggle to see much action this season. But, Briles never runs out of offensive playmakers, and he could add Hasty to the list. Hasty is a four-star prospect out of the Lone Star State who impressed in the spring. Receivers: No team in college football has had the vast amount of talent at the receiver position that the Bears have had, with names like Kendall Wright, Terrence Williams and recently departed Antwan Goodley passing through Waco. And, it certainly makes sense, considering the offense Baylor runs. Sophomore K.D. Cannon is hoping to ensure that he is next up on that growing list of stud receivers for the Bears. 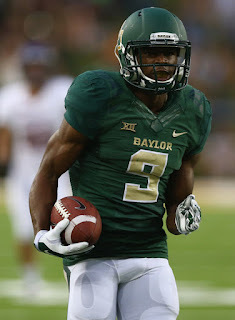 In his first season in Waco, Cannon was amazing, with 58 receptions for 1,030 yards along with eight touchdowns. Cannon's speed is outstanding and he brings a burst of electricity every time he gets ahold of the football. It is pretty crazy what he managed to do at such a young age last season, and he is still growing as a receiver and as a football player. Cannon may turn out to Russell's top target this season, but he is far from his only one. Junior Corey Coleman is also back, along with sophomore Davion Hall and junior Lynx Hawthorne. Coleman actually led the Bears in receiving last season, despite playing in just 10 games. Coleman had 64 catches for 1,119 yards and 11 touchdowns. Together, him and Cannon could form the best 1-2 punch at receiver in all of the land. Hall is a possible breakout candidate after modest numbers a year ago, in which he 15 receptions and 210 yards. Hall is a terrific athlete with next level speed, that should give opposing defenders tons of problems. Hall was prone to mistakes at times a year ago, but considering he was so young, that was definitely understandable. Hawthorne is a rather undersized receiving threat by most comparisons at just six feet but makes of for it with determination and smarts. Hawthorne is great at recognizing and getting to gaps in the defenses. Redshirt freshman Ishmael Zamora is ready to put up huge numbers as well. Zamora arrived last year with a lot of hype but there was just too much experience in front of him, forcing Briles to use a redshirt. Now, the 6'4", 220-pound beast is ready to put on a show. There are few defenders that can match his wide and sturdy frame coupled with his wonderful athleticism. He has great hands as well; if Russell throws the ball anywhere in his vicinity, Zamora is going to make a play on it. Fellow redshirt freshman Chris Platt is a dynamic weapon with a bright future for the Bears. Also back for Baylor is vastly underrated Jay Lee, who just finds a way to make plays. He doesn't have the most explosive speed, but he is an established route runner with plenty of experience. Lee picked up 633 yards and six scores a year ago, while averaging 15.4 yards per reception. Sophomore Quan Jones didn't see much action a season ago and while have to fight for snaps once more this year. But, having a guy with a 6'5" frame and good ball skills would add another layer to the Baylor offense, and Art Briles is always creative. Even with all that talent perhaps the most talked about receiver/tight end of the offseason in Waco was chunk 400-pound LaQuan McGowan. A trick play for the offensive linemen went for a thrilling score against Michigan State and with him not needing to play much on the offensive line, Briles is using him at tight end. Apparently, McGowan has "slimmed down" this spring and summer, but he is still going to be scary for opposing defenders. Sure, a guy who weighs his weight isn't going to beat anybody with speed or anything like that, but he has surprisingly good hands and there isn't a defender in the nation that enjoys trying to bring down a rumbling, determined 400-pound monster. Offensive Line: No matter how much playmakers an offense has, it won't have much success without the time to operate, which it what makes the offensive line so important. Baylor's offensive line should be strong this season, led by All-American-caliber tackle Spencer Drango. Drango seemed set on going pro following his junior season, but after consulting the NFL advisory committee, decided his best choice was to stay for one more year in Waco. It is easy to see why NFL scouts love the veteran; he clearly has an NFL frame at 6'6", 310 pounds and also possesses superior athleticism. He is a proven commodity at a very critical position. Though, Drango isn't the only proven linemen set to return to the unit this season. Junior Kyle Fuller is among the conference's best centers and he should be supported in the interior by two experienced guards, in seniors Jarrell Broxton and Blake Muir. Both Broxton and Muir are proven run blockers who play a very key role in the offense. Both have to show athleticism in order to keep up with the Bears' up-tempo attack, and also get downfield to make blocks for the explosive Linwood and Jefferson. Rounding out Baylor's starting offensive line should be senior Pat Colbert, who also saw a ton of action last season and is very experienced. Colbert brings great size to the table as well, with great footwork and vision. Overall, the whole unit is crazy experienced, with likely four starters being seniors and the only non-senior, Kyle Fuller, having plenty of action in the wide open Big 12. That will be a major help to the youthful Russell and the rest of the Bears' offense. Depth shouldn't be much of a concern either, as senior Desmine Hilliard provides plenty of help off the bench. Yet another vet who knows how to get the job done, Hilliard missed seven games with a wrist injury, with allowed Muir to take his place on the line. Now healthy, Hilliard should fight for his fair share of snaps. Newcomer Maurice Porter is going to play a big role early on his Baylor career. A junior college transfer from Navarro College, Porter brings great size and proven pass blocking. 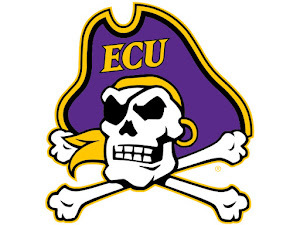 He is rated as a four-star transfer by ESPN and widely viewed as an immediate contributor at either tackle position. Defensive Line: Last bowl season, defensive end Shawn Oakman became a social media sensation, as his massive frame caught the attention of more than just a few people. I mean, how could you miss the 6'9", 280 pound imposing linemen? That frame is certainly one that fits the NFL's standards, but Oakman announced he would return for a senior year. The announcement came just a few days after Drango's decision to stay put and it was huge for the Bears. Oakman was viewed by many as a first or second round-type pick but he also has some major weaknesses. He is not a great run defender, and there were thoughts that he would quit on some plays. That had some NFL scouts worried, and Oakman likely came back to prove those doubters wrong. 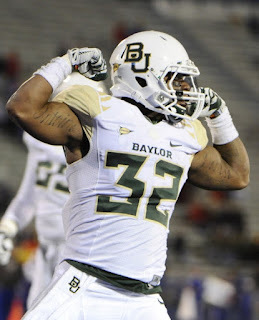 Oakman is not just a huge body, he is a proven contributor. He was second in the Big 12 in sacks last season, with 11 and will only grow into a more complete pass rusher this season. Oakman is joined on the defensive line by a number of physical linemen, including nose tackle Andrew Billings. Billings is far from flashy, but the 300 pound junior is a proven run stopper, with 37 tackles last year and 11.5 of them going for a loss. Billings will pair with senior Beau Blackshear to form a formidable combo in the heart of the unit. Blackshear is another gritty tackle who proved to be a very good pass rusher a season ago. He managed 4.5 sacks and was constantly getting in the face of opposing quarterbacks. The front four should be rounded out by senior defensive end Jamal Palmer. Palmer is ready to finally starting playing consistently again after tearing his ACL towards in the middle of the year. Palmer got off to a fast start prior to the injury, with 14 tackles and 2.5 sacks. In fact, Palmer has put up really good numbers every year that he has been healthy with Baylor, and hopefully he will be this season. Obviously a torn ACL is a pretty traumatic thing to recover from, Palmer has had a lot of time to get to 100 percent. Junior Byron Bonds has the potential to grow into a great rotational piece on the D-Line, while sophomore Brian Nance should put together a good year. Both will backup at defensive end, and can learn and evolve into good pass rushers. Linebackers: Baylor's defense as a whole doesn't get much respect, constantly overshadowed by the team's record-breaking offense. Though, perhaps even more so ignored is the linebacker corps, in large part because there are only two starting 'backers in the Bears' 4-2-5 defensive scheme, led by fifth year defensive coordinator Phil Bennett. Though, the unit was a strength last season and should be solid once more in 2015, even with the loss of Bryce Hager. One of the captains of the defense, Hager was an under-appreciated star in his time in Waco. Hager had 114 total tackles last season, with 12 tackles for loss, and two sacks on top of it. His departure leaves the team scrambling for a solution at middle linebacker. The favorite to take over there is senior Grant Campbell, a sound defensive player who doesn't make much mistakes. He isn't the most athletic or imposing linebacker in the land but neither was Hager, who just simply got the job done when asked. Sophomore Raaquan Davis is a little bit more flashy and exciting but is inexperienced and will need time to adjust to a much larger role. The star of the unit is going to be sophomore Taylor Young. Young was plunged into a starting role last season and was wonderful, as he recorded 92 tackles, four sacks along with two forced fumbles. That was enough to earn him Defensive Freshman of the Year honors inside the conference, and he should be much improved in his second year with the squad. Young is a fabulous athlete who can do it all defensively for the Bears. He has the size and toughness to get after the quarterback, the quickness to the ball of a run defender and he is solid in coverage. Three-star recruit Clay Johnston may get some opportunities early on to show what he can do. Coming from Abilene, Texas the versatile linebacker can contribute anywhere and offers a great mind for the game. He will be joined in the Class of 2015 by Eric Ogor, a relatively unhyped outside linebacker, along with Lenoy Jones Jr., who stays home in Waco. None of the trio are overwhelmingly big time recruits by are pipeline finds for Art Briles who may see action in case of injuries or something else catastrophic. Secondary: The Big 12 has long been known as a pass-happy, spread offense-orientated league and the top teams usually find ways to have success in pass coverage. Baylor has been decent against the pass the past couple seasons, but is looking to get even better this year, which would certainly help them get over the top and prove themselves as a legit Playoff team. Baylor will have the luxury of having two experienced ball hawks returning at cornerback, including junior Xavien Howard and junior Ryan Reid. Howard proved to be among the best playmakers in the Big 12 a year ago, with four interceptions. He is gifted with good size and toughness that allow him to hang with bigger receivers and still make a play on the ball. Quarterbacks will opt not to throw Howard's way often but he'll still find a way to make plays. Reid is a solid contributor who has shown that he can be a shutdown corner at times, but is still learning the ropes. Junior Orion Stewart's return is a major boost to the defensive backfield. Stewart isn't afraid of anyone or anything and is an example of the type of passion Bennett likes to instill on this defense. He proved to be a playmaker as well throughout the 2015 campaign, with four interceptions himself. He is slated to start in an important deep safety role; since the Big 12 is generally so pass-happy, he will be responsible for a huge part of the field and if he gets beat things are going for six. That is certainly a lot of pressure, but Stewart has proven that not only can he handle it, he excels. Senior Terrell Burt joins Stewart at safety, after putting together a junior campaign in which he had 53 tackles and six pass deflections. Burt is more of a help as a run defender and the Bears will often look up to him to make plays on blitzes and rushes as well. The starting unit rounds out with the nickelback spot, which is perhaps the greatest weakness of the secondary. Sophomore Travon Blanchard is the likely starter and while he possesses plenty of upside, but he had some major ups-and-downs last season. Junior Patrick Levels is slightly more experienced than Blanchard but doesn't possess the closing ability or upside of the young Blanchard. Whoever starts will play a critical role in the Baylor defense and stopping the pass. Depth shouldn't be a major concern with young players ready to step up into bigger roles. Sophomore Chance Waz has plenty of upside at safety and has great versatility, while junior Terrence Singleton has proven he can play very well at cornerback. Art Briles and staff do a great job of picking up young prospects that aren't always very hyped, but fit the system well and will contribute down the line. That holds true this year with prospects like Jordan Tolbert and Henry Black coming into the defensive backfield. Both three-star prospects, they will see action in a few years at cornerback, and learn the ropes from their veterans this season. Special Teams: Punters don't get much credit, but there shouldn't be much denying how great Spencer Roth was at Baylor. He finished up second all-time in school history with a 43.7 career punt average, and always ensured Baylor had favorable field position. His replacement? It is completely unclear right now. At least kicker should be in good hands, with young but talented Chris Callahan back for a sophomore year. The time is now for Baylor to prove themselves as a legit Championship contender. They have had back-to-back 11-win years but have often stumbled in big games and were very adamant last year in their belief they deserved a Playoff bid. Breaking in Russell won't be terrible; he has so much to work with and the whole first half of the season is against terrible defensive teams (Lamar, Rice, Kansas, Iowa State to name a few). And, even if Russell doesn't fit smoothly into Petty's place right away there is so much talent on this roster not to win games. There are future NFL studs across the roster and down the depth chart, something I don't think a lot of people ever thought would happen in Waco. Without a necessarily tough schedule, the Bears probably have to win out to make the Playoff. In fact, they will almost certainly have to; beating the pulp out of SMU isn't going to prove anything to anyone. That means the November 27th game will be the de facto Big 12 Championship Game, and likely will decide Baylor's fate. A win there, and the program could take the next step, and vault themselves into the biggest event in school history.